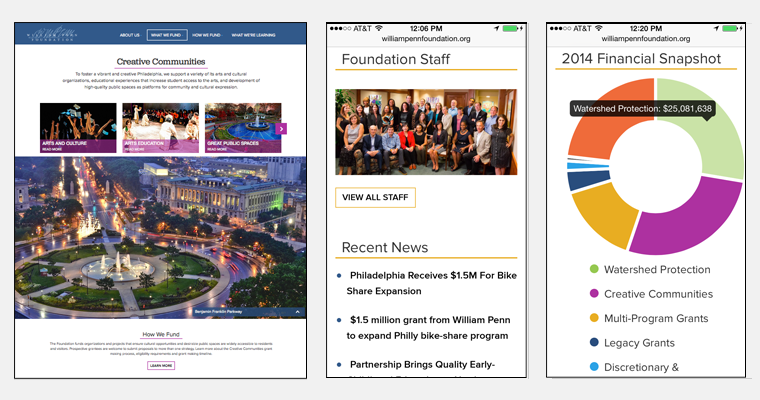 William Penn Foundation, a family foundation with its roots firmly planted in Philadelphia, turned to I-SITE to create a fresh new website to clearly and elegantly communicate its philanthropic mission to the region’s community of innovators and grant seekers. Established over 70 years ago by Otto and Phoebe Haas the foundation is focused on three program areas; helping improve education for low-income children; ensuring a sustainable environment; and fostering creative communities that enhance civic life and advance philanthropy in the Greater Philadelphia region. The I-SITE team first reached out to the community to gain insight on what the previous grantees seek most in the Foundation’s website. Coupled with insight from the highly experienced Foundation staff, the team was able to develop a more streamlined site structure with clear call-to-actions. The subsequent wireframe prototypes allowed the team to test the effectiveness of the new approach. For the design there was strong directive to create an elegant design that is both contemporary but also rooted in the strength and heritage of the Foundation’s brand. I-SITE partnered with award-winning designer Andee Mazzocco of Whole-Brained Design on the creative direction of the website. Having previously completed a number of projects for the Foundation, Andee brought extensive knowledge of their programs and design guidelines. Built on the Drupal CMS platform the website is fully responsive and integrates both video and the full database of grants awarded since 2013. The What We’re Learning section also allows filtering by year and program area. Since launch in summer 2015 the website has been well received both by the community at large and by the staff as a tool to disseminate information and educate and prequalify potential grantees. The I-SITE team continues to offer support to the Foundation both for additional features and strategic direction.